The Age of Enlightenment, also known as the Age of Reason, was a philosophical movement of the 18th century, whose goals were to end abuses of the church and state and instill progress and tolerance in their place. The movement, which began in France, was named by the writers who were a part of it: Voltaire and Rousseau. 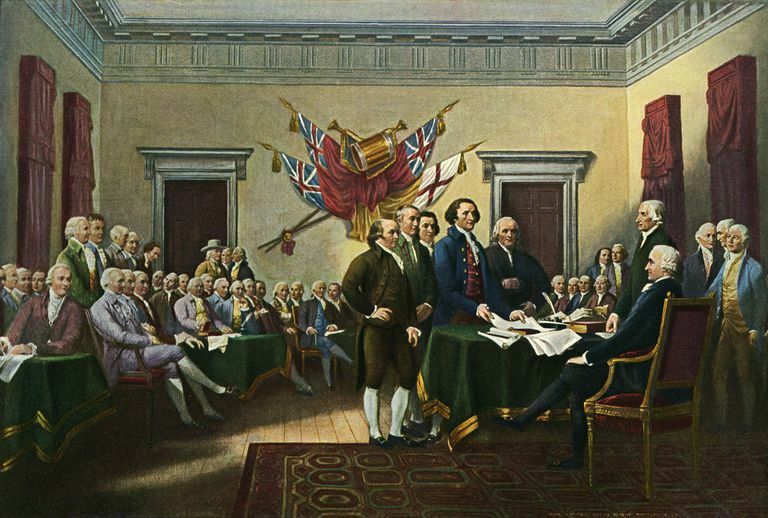 It came to include British writers such as Locke and Hume, as well as Americans like Jefferson, Washington, Thomas Paine and Benjamin Franklin. Several books have been written about the Enlightenment and its participants. Here are a few titles to help you learn more about the movement known as The Enlightenment. by Alan Charles Kors (Editor). Oxford University Press. This compilation by University of Pennsylvania history professor Alan Charles Kors expands beyond the traditional centers of the movement such as Paris, but includes other, less well known centers of activity such as Edinburgh, Geneva, Philadelphia and Milan for consideration. It is exhaustively researched and detailed. From the publisher: "Designed and organized for ease of use, its special features include more than 700 signed articles; annotated bibliographies following each article to guide further study; an extensive system of cross-references; a synoptic outline of contents; a comprehensive topical index providing easy access to networks of related articles; and high quality illustrations, including photographs, line drawings, and maps." by Isaac Kramnick (Editor). Penguin. Cornell professor Issac Kramnick collects easy-to-read selections from the top writers of the Age of Reason, showing how the philosophy informed not just literature and essays, but other areas of society as well. From the publisher: "This volume brings together the era's classic works, with more than a hundred selections from a broad range of sources—including works by Kant, Diderot, Voltaire, Newton, Rousseau, Locke, Franklin, Jefferson, Madison, and Paine—that demonstrate the pervasive impact of Enlightenment views on philosophy and epistemology as well as on political, social, and economic institutions." Most writing about the Enlightenment focuses on France, but very little attention is paid to Britain. Roy Porter definitively shows that underestimating Britain's role in this movement is misguided. He gives us the works of Pope, Mary Wollstonecraft and William Godwin, and Defoe as evidence that Britain was very much influenced by the new ways of thinking engendered by the Age of Reason. From the publisher: "This engagingly written new work highlights Britain's long-underestimated and pivotal role in disseminating the ideas and culture of the Enlightenment. Moving beyond the numerous histories centered on France and Germany, the acclaimed social historian Roy Porter explains how monumental changes in thinking in Britain influenced worldwide developments." by Paul Hyland (Editor), Olga Gomez (Editor), and Francesca Greensides (Editor). Routledge. Including writers like Hobbes, Rousseau, Diderot and Kant in one volume offers comparison and contrast for the varied works written during this period. The essays are organized thematically, with sections on political theory, religion and art and nature, to further illustrate the far-reaching influence of the Enlightenment on all aspects of Western society. From the publisher: "The Enlightenment Reader brings together the work of major Enlightenment thinkers to illustrate the full importance and achievements of this period in history." by Eve Tavor Bannet. Johns Hopkins University Press. Bannet explores the impact the Enlightenment had on women and women writers of the 18th century. Its influence on women can be felt in social, political and economic realms, the author argues, and began to challenge the traditional gender roles of marriage and family. From the publisher: "Bannet examines the works of women writers who fell into two distinct camps: 'Matriarchs' such as Eliza Haywood, Maria Edgeworth, and Hannah More argued that women had a superiority of sense and virtue over men and needed to take control of the family." by Robert A. Ferguson. Harvard University Press. This work keeps the focus squarely on the American writers of the Enlightenment age, showing how they, too were widely influenced by the revolutionary ideas coming out of Europe, even as American society and identity was still being formed. From the publisher: "This concise literary history of the American Enlightenment captures the varied and conflicting voices of religious and political conviction in the decades when the new nation was formed. Ferguson's trenchant interpretation yields new understanding of this pivotal period for American culture." by Emmanuel Chukwudi Eze. Blackwell Publishers. Much of this compilation includes excerpts from books not widely available, which examine the influence that the Enlightenment had on attitudes toward race. From the publisher: "Emmanuel Chukwudi Eze collects into one convenient and controversial volume the most important and influential writings on race that the European Enlightenment produced."